Having recovered from a very busy Crick Boat Show where we met lots of lovely customers, we were ready to set off for our summer cruise this morning. We’ve travelled a long distance if you add total the up and down movements and the side to side swaying as we stayed on our home mooring at Sherborne Wharf in Birmingham. With torrential rain and strong winds we weren’t going cruising. I’m not sure about tomorrow, but we’ll be heading towards Lapworth when the weather improves. We’re filming the River Nene, the Middle Level Navigations, and the River Great Ouse and tributaries this summer, as well as checking all the information on our maps is up to date. While moored up I took the time to investigate information sent a few weeks ago by Brian on Harnser who is one of several kind boaters who contribute updates to my maps. Brian has identified a former route of the Trent & Mersey Canal at Lawton Locks which I can add to my maps. Lawton Locks on the Trent & Mersey Canal on 1882 OS map. The current route is clearly shown on this 1882 OS map extract. An alternative route, passing further north, seems to be identifiable on the map, although the details, such as the lock positions aren’t shown. 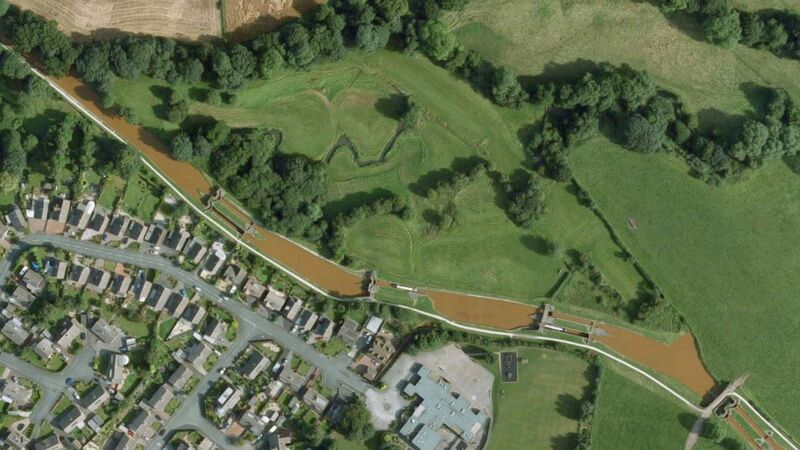 Google Maps satellite photo of Lawton Locks on Trent & Mersey Canal. Google Maps satellite photo suggests the alternative route to the north was there, with the three Lawton Locks visible on the open route. These were all paired, although the middle lock is no longer paired. 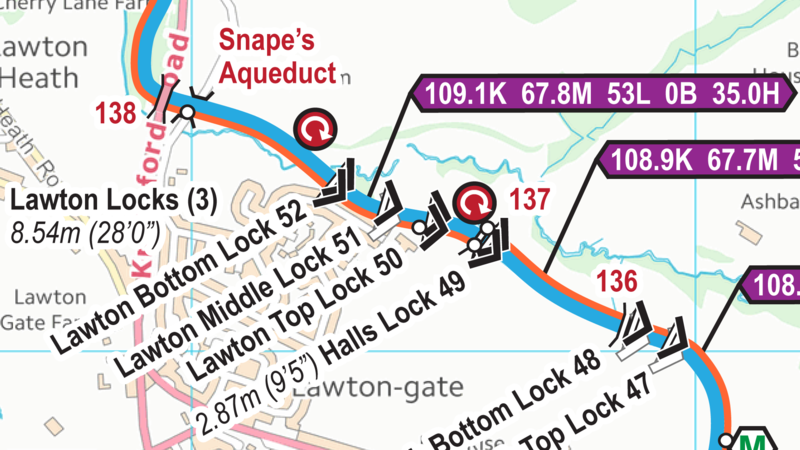 Extract from Waterway Routes Trent & Mersey Canal Map for Lawton Locks. My maps show winding points above and below Lawton Locks at the points where the routes diverge. I’d like to add the former route but I’ve been unable to find any further details. 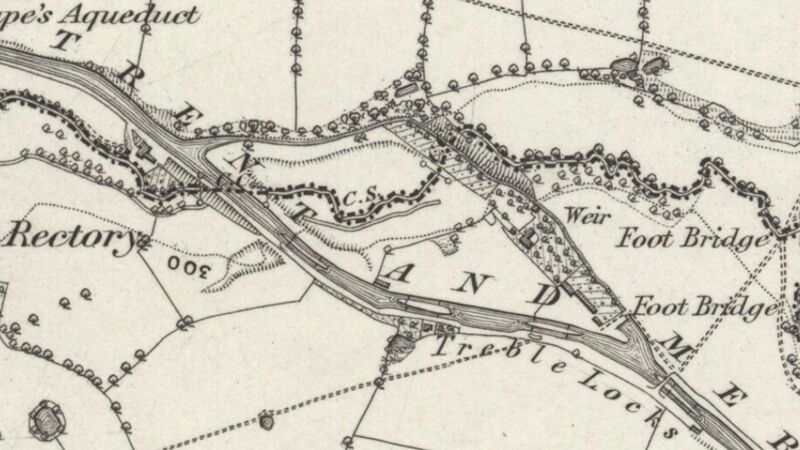 Is there an old map which shows the former route, particularly the position of the locks? When was the route changed? Why was the route changed? Any extra information, left as a comment or emailed to paul@waterwayroutes.co.uk, will be greatly appreciated. This entry was posted in Trent & Mersey Canal, Trent & Mersey Canal Maps by Paul. Bookmark the permalink.